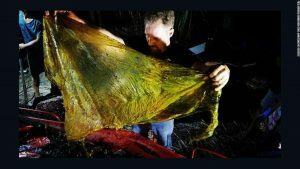 Darrell Blatchley, above, found around 40 kilograms of rice sacks, grocery bags, banana plantation bags and general plastic bags in the stomach of the whale. 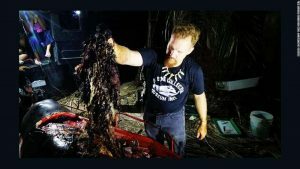 – Darrell Blatchley/D’ Bone Collector Museum Inc.
DAVAO, PHILIPPINES – A young whale whose carcass washed up in the Philippines died of “dehydration and starvation” after consuming 40 kilograms (88 pounds) of plastic bags, scientists have found. The whale died of dehydration and starvation after being left unable to obtain sufficient water from its food, Blatchley said. – Darrell Blatchley/D’ Bone Collector Museum Inc.